Growing up in India where cricket is somewhat a religion, the image that would come to my mind if you mentioned West Indies was that of Kallicharan, Viv Richards, Malcolm Marshall, Brian Lara and several other Gods of cricket. Little did I know back then that I would someday visit this beautiful country so far from home and learn about its history, roots and culture while licking the last traces of a delicious home- made duck curry off my fingers! 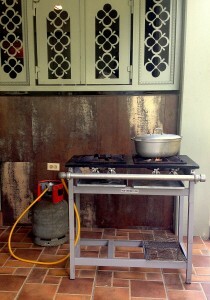 My two day trip to Trinidad & Tobago was a culinary adventure right from the time I set foot on the island. I landed in Port of Spain as the sun was rising over the blue Caribbean sea and my first stop was at a ‘Roti Shop’ which was already bustling with people that early in the morning. I had my first taste of the ‘Doubles’ here which is a popular street food usually eaten for breakfast. 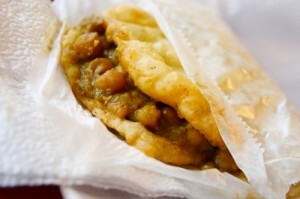 Very similar to poori, it is two pieces of fried bread packed with Chana (curried chickpeas) and wrapped in newspaper. If you are Indian, you would ask what’s so special about it? The answer to that, my friend, is the hot Trinidadian pepper sauce- grown and made in Trinidad which has an undeniable addictive quality to it. I assure you, Indian or not…you cannot stop at one bite! The food in Trinidad is a melting pot in its true sense, with a mix of Indian, African, Chinese, Spanish, Portuguese and French. My obvious interest was to learn more about the strong Indian roots that were so abundantly present amongst the people, the culture, the food, the last names and the keen interest in Bollywood cinema! The Indians in Trinidad came from small villages in Northern regions (particularly from the states of Bihar & Uttarpradesh), in the early 19th century mostly to work in the sugar plantations as farm help. 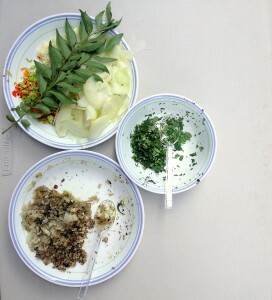 Despite the alien conditions they kept their traditions alive specially in the form of their cuisine. They used local ingredients, produce and spices as substitutes to make their familiar home-cooked meals which has now evolved to a distinct cuisine of its own. The flavors are unique and zesty- just the kind of excitement you look for to fall in love! 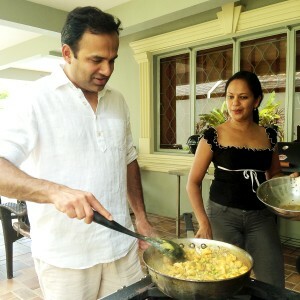 The Chana, for example – which is the local favorite, has a flavorf ul mix of fresh thyme, chives , curry leaves and parsley; the spicy kick of habanero mixed with the local curry powder and a very special garam masala known to Trinidadians as Amchar Masala! 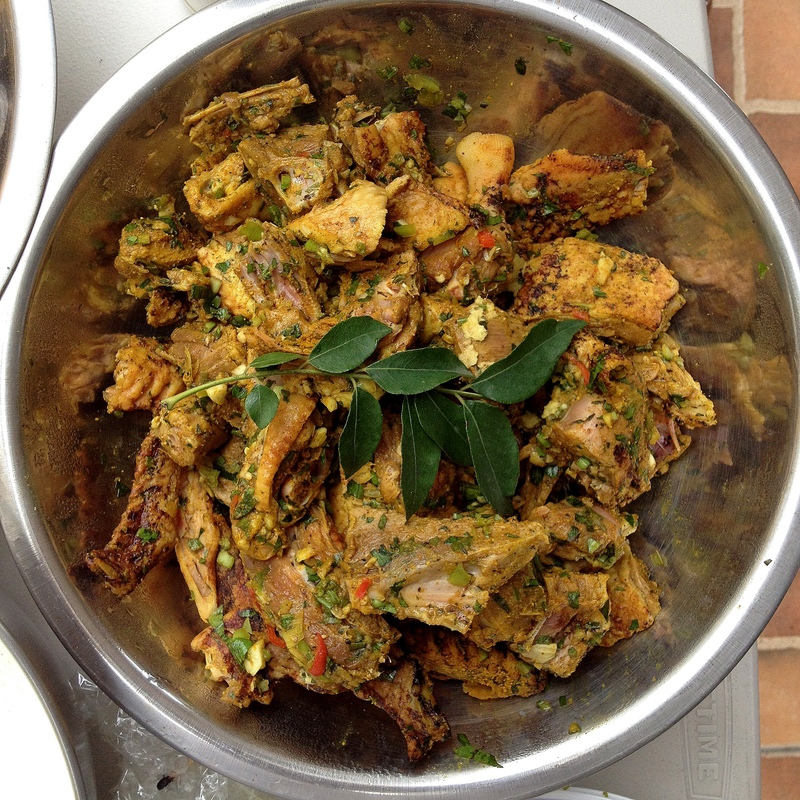 If you are visiting my home in Jersey and cannot trace a particular taste in a dish to something you know, this spice mix is probably the secret! I could not leave Trinidad without buying a few packets of it. Apart from the fantastic food, one of my favorite experiences was also the warm and welcoming hospitality of the Trinidadians. I was there just for a weekend and by the end of the trip the people I met there seemed very familiar from very long ago. 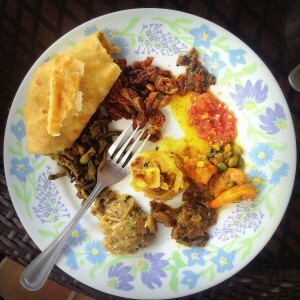 One of them invited me home in the first few minutes of us meeting to experience traditional home cooked Trinidadian food over lunch. How many of us do that in these days of terror and caution? No way was I going to pass on that! And I have to say that it was the most interesting and educational lunches I ever had outside my culinary schools! 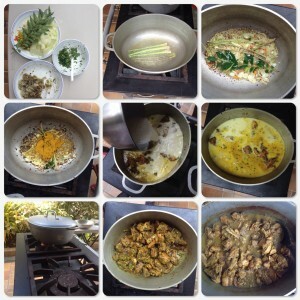 I came back full…not just with a fantastically tasty meal, but lessons on cooking methods and spices, stories behind the evolution of the dishes, a tour of the local herb garden and even a firsthand experience of learning to cook a spicy duck curry from a Trinidadian local- right from scratch! Other dishes that I got to cook and taste were some popular and staple vegetarian dishes in Trinidadian Indian cuisine like Baingan Choka (roasted and seasoned mashed eggplant) and Tomato Choka (roasted and seasoned tomato dip). As I stirred the ingredients in the pan, I wondered if the term choka is derived from the hindi word “chhownk” or tadka, which is tempering a dish with hot seasoned oil. Dal Poori – a flatbread stuffed with Indian peas- was the main accompaniment of the meal which is the Trinidadian version of Indian paratha. Interesting to note that Bengal too has a similar bread in its cuisine. It blows your mind to think a bread with the same name and similar stuffing has traveled 15000 miles and few hundred years of history to find its place in the Trinidadian mainstream cuisine today! Coming back to the duck curry which was the obvious highlight of my meal and cooking class that warm Sunday afternoon- I really would never have been able to trace half the flavor if I had not learnt to cook it myself. Made with a mixture of lemon grass, curry leaves, amchaar masala, a spice paste made with garlic and habanero and chief brand curry powder (can be found in West Indian markets)- it is slow cooked in coconut milk that gives a subtle sweet balance to the zesty heat of the spices. With the duck simmering away on the stove and with yet another round of coconut water and vodka over ice, I made sure to pen down the ingredients with every intention of recreating the dish a few times in my kitchen..
To make Curry Duck – Marinate bone-in duck pieces with chief brand curry powder, garlic paste, lime juice, amchaar masal, minced herbs (cilantro, parsley, thyme) hot pepper sauce, salt & pepper. Sauté lemon grass, curry leaves, pimento peppers, hot pepper, sliced onion, curry leaves, curry powder, saffron (turmeric) , amchar masala and duck. Add coconut milk & simmer for an hour until tender.